EBONICS YOU'VE HEARD OF. Hear, now, about Hebonics. Sometimes called Jewish English, Hebonics is actually a distinct language spoken by American Jews of Eastern European origin. Its speech patterns are based on the Ashkenazic language systems native to Russia, Poland, and Rumania. Hebonics – the term is an amalgam of "Hebrew phonics" – is more than a mere dialect. It has rules of grammar, pronunciation, and syntax that distinguish it from standard English. In Hebonics, for example, the letter "w" is often pronounced "v." ("Vy don't ve go for a valk?") Consonants are hardened at the end of words. ("I luff to eat rye breadt.") And the "th" sound is frequently rendered as a "t." ("Vun, two, tree, four …") Combining all three rules might yield a sentence such as: "Tenks Gott, I feel pretty vell, andt you?" Several Hebonics usages have entered idiomatic American English. The best known may be the expression of dismissive contempt through repetition, adding an "sh" sound to the second word: "Jennings, Shmennings – I only vatch Tom Brokaw." It's OK, laugh. "Hebonics" is a joke. Treat the broken English of Yiddish speakers as a genuine language? Hilarious! And nobody would find the notion more absurd than – American Jews of Eastern European origin. Especially those for whom the 11th Commandment has always been: "Thou shalt make sure thy children get a good education." The fractured spelling and tortured pronunciation of "Hebonics" are errors to be corrected, not a "linguistic code" to be legitimized. Any Jewish parent or teacher who suggested otherwise would be guffawed out of town. Ebonics should be a joke, too. But in dozens of urban public schools, it has become a tragedy. Oakland's Board of Education drew nationwide scorn with its recent vote to teach black schoolchildren in ghetto-ese. But as Kate Zernike reported in the Boston Globe last week, Oakland is not alone. In Los Angeles, more than 30 schools have already implemented Ebonics programs. 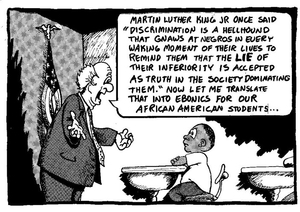 "Teachers are taught to ignore students' lapses into Black English," Zernike wrote. Bad diction is overlooked. Improper tenses aren't flagged. Gloria Lezine, a teacher at the Woodcrest School in South Central Los Angeles, told Zernike that she would never correct a student's dropped g's or "tell him to fix his double negative. She would never strike spelling errors with a red pen. What's wrong, she says, is telling students they're wrong." This is the self-esteem movement gone insane. For generations, countless millions of poor English speakers viewed mastery of the language as a critical key to success and self-respect. Now come the Ebonics extremists, and proclaim the opposite: Make young black Americans learn proper English and their cultural pride will be shattered. "If we degrade their language," says one Los Angeles Ebonics instructor, "we're degrading their whole home environment, their whole race. That creates a filter; they just tune us out." Translation: Black children are too dumb to learn good English. If you're looking for racism, look no further. Naturally, kids trapped in the Ebonics schools are growing up illiterate. At the 31 Los Angeles schools that treat street slang as an authentic language, grades have plummeted. Reading scores for the Woodcrest School's fourth graders sank to the 12th percentile last year. The citywide average, reported Zernike, was 36, while fourth graders in non-Ebonics schools scored above the 70th percentile. "Where were you that time what you wrote me? Do you get together after with each other? Rita changed her mind and wrote me a letter, but I do not think that I will answer it. How is she with you, did you talk to her and when, not because it interest me just I want to know what did she told you about me." That young immigrant struggling to write in English was the man who became my father. I grew up in a world filled with men and women whose English was no better than his. None of them believed that their lousy language skills deserved "respect" or "validation." None would have sent their children to schools that did believe it. Their English may have been shaky, but they weren't stupid. Hebonics, shmebonics. Broken English is nothing to be proud of. And every child can learn to speak correctly.